CRUISIN AUTOMOTIVE are the only authorised W.A. dealer of Dakota Digital. We can supply & install. The HDX series from Dakota Digital is the latest in aftermarket automotive instrumentation technology. HDX takes personalisation and usability to a whole new dimension while retaining your favorite features from the wildly popular VHX-series such as LED backlighting for the numbers, tick marks and dead-faced dash indicators (turn signals, high beam, check engine, cruise control engaged and parking brake). Illuminated needles and a lifetime warranty are still part of the deal as well. These features add up to a clean, easy to read instrument system in all conditions. Precision stepper motors provide accurate needle movement along with a full-sweep at key-on, and the needle hubs are black nickel plated spun-aluminum. 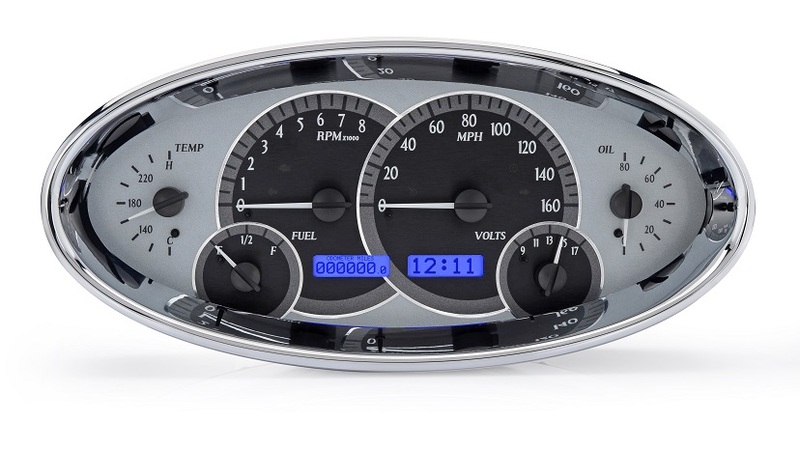 Available with your choice of black or silver alloy gauge-face styling, each HDX system allows the user to select their favorite illumination color for the gauge readings and needles, as well as the TFT message center displays. Can’t see the product you are chasing? No problem. CRUISIN AUTOMOTIVE will source the product for you. Ring Ian now on 0417 911 702.